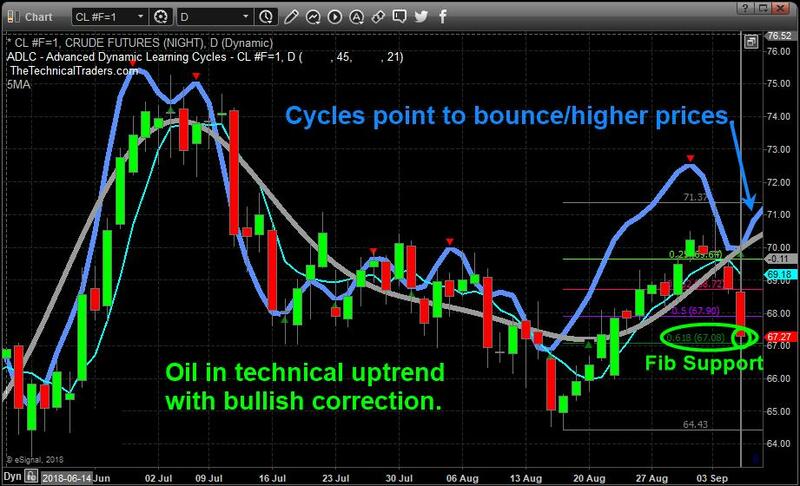 Our research team warned of this move in Crude Oil back on October 7, 2018. At that time, we cautioned that Oil may follow a historical price pattern, moving dramatically lower and that lows near $65 may become the ultimate bottom for that move. Here we are with a price below that level, and many are asking “where will it go from here?”. We believe the support near $65, although clearly broken, may eventually become resistance for a future upside price move. Our proprietary Fibonacci price modeling system is suggesting a new target near $52~53, and we believe this downside move in Oil is far from over at this point. Posted in INO.com ContributorsTagged Chris Vermeulen Crude Oil crude oil analysis Crude Oil Prices Techinical Analysis2 Comments on Will Oil Find Support Near $60? 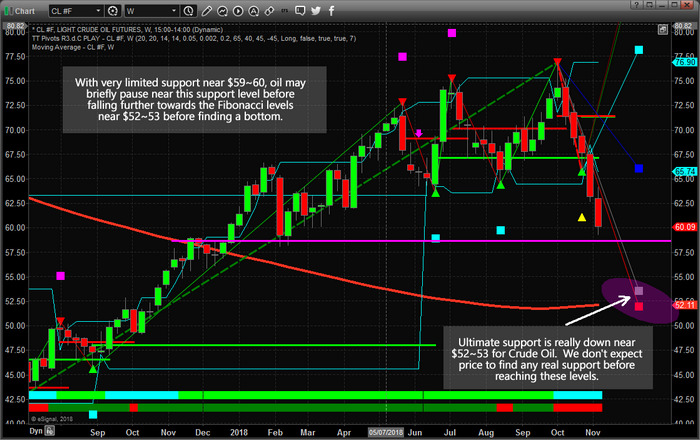 I have focused my attention on the recent price rotation in the Crude Oil market. I believe the recent downside rotation in price, while technically still in a bullish trend, is an excellent opportunity for traders to identify entry positions for a potential price rally to levels near or above $70~71 ppb. My proprietary price modeling systems and price cycle systems are clearly illustrating that Oil prices should find support, bottom and rotate higher within the next 5~7+ days. I rely on these proprietary indicators and modeling systems to help understand when opportunities exist in the markets. When I can determine that price is moving counter to a primary trend and creating what I call a “price anomaly”, where enhanced opportunity exists for a profitable outcome, I attempt to determine if this trigger warrants alerting our followers. In this case, I believe the opportunity for upside price action following this price rotation is exceptional. This first chart shows our proprietary price cycle modeling system at work and clearly shows the key Fibonacci support levels that I believe will act as a floor for the price of Oil. I believe a bottom will form near $67 ppb and a new price rally will result in prices moving quickly back above $70 ppb. 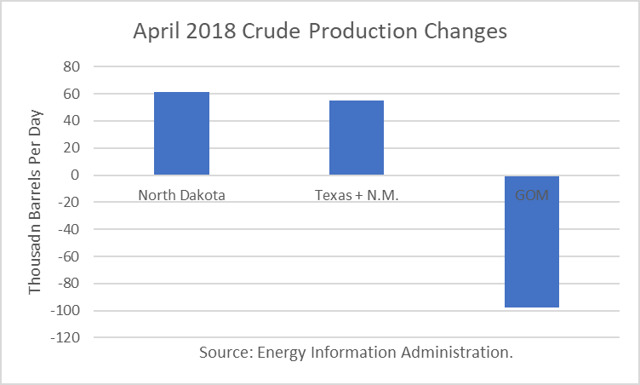 The Energy Information Administration reported that April crude oil production averaged 10.467 million barrels per day (mmbd), off 2,000 b/d from March’s all-time record high for the U.S. The small but unexpected decline was due to unplanned maintenance in the Gulf of Mexico (GOM), which reduced production there by 98,000 b/d. Otherwise, healthy increases were recorded in North Dakota (61,000 b/d) and Texas + New Mexico (55,000 b/d). What Oil Price Band Do The Saudis Want? Back in December, I deduced that the Saudis had budgeted a little less than $53 for oil in 2017. Their budget was based on their belief that they didn't expect to see any U.S. shale oil production response in 2017. Saudi Energy Minister Khalid A. Al-Falih said it in answer to a question in the press conference after the OPEC/non-OPEC meeting (see video starting at 51:35). He backed-up his belief basing it on the time lag of when oil prices had peaked in 2014 and when production peaked in 2015. After the deals went into effect on January 1st, oil prices remained above $50 per barrel. According to the EIA’s weekly production data, U.S. crude production rose by 318,000 b/d between the last week of December and the week ending March 3rd, just before Al-Fahil’s speech in Houston during on March 7th. Posted in INO.com ContributorsTagged Crude Oil Crude Oil Prices Global Oil Demand Global Oil Inventories Global Oil Market OPEC meeting Rig Counts Robert Boslego Saudi Energy Minister Khalid Al-Falih The Organization of the Petroleum Exporting Countries (OPEC) WTI Crude Oil3 Comments on What Oil Price Band Do The Saudis Want?